I'm a fan, but I admit that they can be...tricky. In the summer, I'm all about the big, fresh salads. I have an entire shelf of my refrigerator dedicated to salad greens. I buy them by the pound and they fill up every nook in the fridge with their vibrant bounty. My summer intern once went to go put her lunch away and came back remarking that "it looks so healthy in there!" I'll make myself these giant bowls of salad (Seriously...I never use anything smaller than the big metal bowl that comes with my KitchenAid mixer.) and am perfectly happy to call it a day. But once it gets chilly outside, I crave salads that bring more to the table than just a pile of fresh greens and tangy dressing. I need things I can chew. Crunchy things. And filling things. A bit of sweetness. 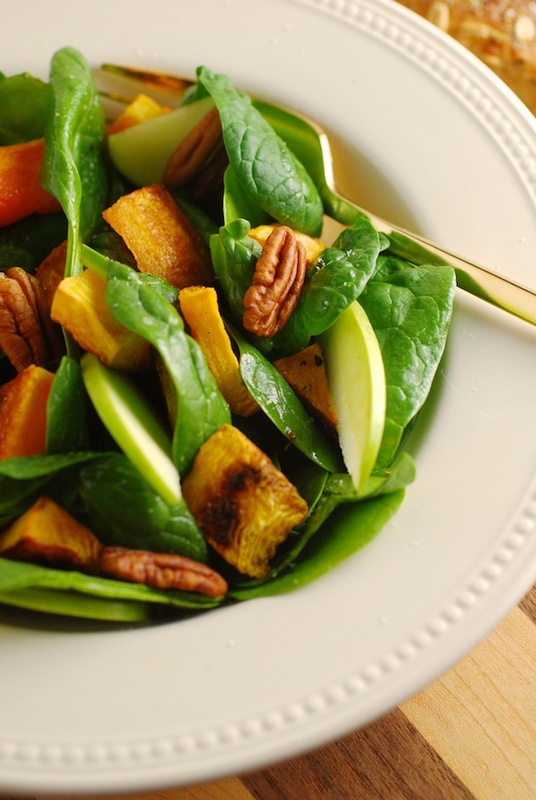 This Roasted Butternut Squash, Apple & Spinach Salad has become one of my lunchtime staples. Dressed with a tangy mustard vinaigrette, it hits all the points I mentioned above, and is also lovely to look at. I make it easy on myself by roasted the squash in big batches ahead of time, then I just toss it with pre-washed spinach, and slice a few apples. A few toasted pecans are always a welcome addition. You may want a quick and easy salad to add to your Thanksgiving table. Or you might want something light for the days after. Either way, I recommend adding this one to your repertoire. Preheat oven to 400 degrees. Toss the squash with olive oil, salt, and pepper, and spread on two large baking sheets. Roast for 20-30 minutes or until tender. Prepare the dressing: In a mason jar with lid, combine all the dressing ingredients. Cover tightly and shake vigorously for 1 minute, or until dressing is creamy. Taste and adjust seasoning to taste if necessary. Combine the roasted squash, apple slices, and spinach in a large bowl. Toss with some of the dressing (not all! ), and garnish with toasted pecans. Serve immediately. Additional topping ideas: dried cranberries, bacon, grilled shrimp or chicken to make it an entree salad, fresh pomegranate seeds…have fun!